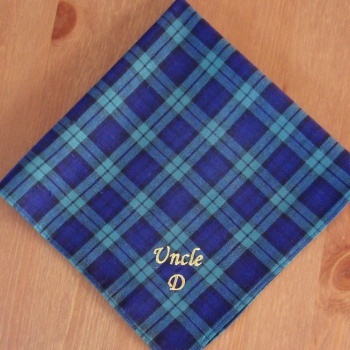 Personalised embroidered mens Black Watch tartan cotton handkerchief. Personalised embroidered mens Black Watch tartan cotton handkerchief. You can choose to have personalised with initials or a name in a text thread colour of your choice. Select from one single hanky or a gift set of 3 handkerchiefs. Personalised embroidered mens Black Watch tartan cotton handkerchief. You can choose to have personalised with initials or a name in a text thread colour of your choice. Select from one single hanky or a gift set of 3 handkerchiefs. This fabric design is the modern blackwatch tartan hanky which features blue, black and green. Please allow at least 2 days for personalised orders to be dispatched as they are customised to order by Amys Gifts.